The Liberals returned to power in 1906 and made significant reforms. Below the upper class, the era was marked by significant shifts in politics among sections of society that had largely been excluded from power, such as common labourers, servants, the industrial working class, and the Irish. Women started to play more of a role in politics. The Edwardian period is sometimes portrayed as a romantic golden age of long summer afternoons and garden parties, basking in a sun that never sets on the British Empire. This perception was created in the 1920s and later by those who remembered the Edwardian age with nostalgia, looking back to their childhoods across the abyss of the Great War. The Edwardian age was also seen as a mediocre period of pleasure between the great achievements of the preceding Victorian age and the catastrophe of the following war. Recent assessments emphasise the great differences between the wealthy and the poor during this period and describe the age as heralding great changes in political and social life. Historian Lawrence James has argued that the leaders felt increasingly threatened by rival powers such as Germany, Russia, and the United States. The sudden arrival of world war in summer 1914 was largely unexpected; only the Royal Navy was prepared for war. There was a growing political awareness among the working class, leading to a rise in trade unions, the Labour movement and demands for better working conditions. The aristocracy remained in control of top government offices. The Conservatives – at the time called "Unionists" – were the dominant political party from the 1890s until 1906. The party had many strengths, appealing to voters supportive of imperialism, tariffs, the Church of England, a powerful Royal Navy, and traditional hierarchical society. There was a powerful leadership base in the landed aristocracy and landed gentry in rural England, plus strong support from the Church of England and military interests. Historians have used election returns to demonstrate that Conservatives did surprisingly well in working-class districts. They had an appeal as well to the better-off element of traditional working-class Britons in the larger cities. In rural areas, the national headquarters made highly effective use of paid traveling lecturers, with pamphlets, posters, and especially lantern slides, who were able to communicate effectively with rural voters – particularly the newly enfranchised agricultural workers. In the first years of the twentieth century, the Conservative government, with Arthur Balfour as Prime Minister, had numerous successes in foreign policy, defence, and education, as well as solutions for the issues of alcohol licensing and land ownership for the peasants of Ireland. Nevertheless, the weaknesses were accumulating, and proved so overwhelming in 1906 that they did not return to complete power until 1922. The Conservative Party was losing its drive and enthusiasm, especially after the retirement of the charismatic Joseph Chamberlain. There was a bitter split on "tariff reform" (that is, imposing tariffs or taxes on all imports), that drove many of the free traders over to the Liberal camp. Tariff reform was a losing issue that the Conservative leadership inexplicably clung to. Conservative support weakened among the top tier of the working-class and lower middle-class, and there was dissatisfaction among the intellectuals. The 1906 general election was a landslide victory for the Liberal Party, which saw its total vote share increase by 25%, while the Conservative total vote held steady. The Liberal Party lacked a unified ideological base in 1906. It contained numerous contradictory and hostile factions, such as imperialists and supporters of the Boers; near-socialists and laissez-faire classical liberals; suffragettes and opponents of women's suffrage; antiwar elements and supporters of the military alliance with France. Non-Conformist Dissenters – Protestants outside the Anglican fold – were a powerful element, dedicated to opposing the established church in terms of education and taxation. However, the Dissenters were losing support and society at large and played a lesser and lesser role in party affairs after 1900. The Party, furthermore, also included Irish Catholics, and secularists from the labour movement. The middle-class business, professional and intellectual communities were generally strongholds, although some old aristocratic families played important roles as well. The working-class element was moving rapidly toward the newly emerging Labour Party. One uniting element was widespread agreement on the use of politics and Parliament as a device to upgrade and improve society and to reform politics. The Labour Party was emerging from the rapidly growing trade union movement after 1890. In 1903 it entered the Gladstone–MacDonald pact with the Liberals, allowing for cross-party support in elections, and the emergence of a small Labour contingent in Parliament. It was a temporary arrangement until the 1920s, when the Labour Party was strong enough to act on its own, and the Liberals were in an irreversible decline. Subtle social changes in the working-class were producing a younger generation that wanted to act independently. Michael Childs argues that the younger generation had reason to prefer Labour over Liberal political styles. Social factors included secularised elementary education (with a disappearing role for Dissenting schools that inculcated Liberal viewpoints); the "New Unionism" after 1890 brought unskilled workers into a movement previously dominated by the skilled workers; and new leisure activities, especially the music hall and sports, involved youth while repelling the older generation of Liberal voters. The government entered the Second Boer War with great confidence, little expecting that the two small rural Boer republics in southern Africa with a combined White population less than London would hold off the concentrated power of the British Empire for two and half years, and take 400,000 Imperial troops to secure victory. The war split the Liberal Party into anti- and pro-war factions. Great orators, such as Liberal David Lloyd George, who spoke against the war, became increasingly influential. 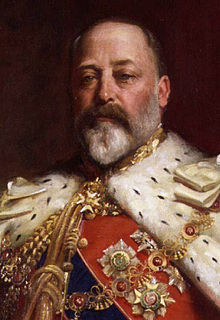 Nevertheless, Liberal Unionist Joseph Chamberlain, who was largely in charge of the war, maintained his hold on power. When General Kitchener took command in 1900, he initiated a scorched earth policy in order to foil Boer guerilla tactics. Captured Boer combatants were transported overseas to other British possessions as prisoners of war. However he relocated noncombatant Boers—mostly women and children—into heavily guarded internment camps. The internment camps were overcrowded with bad sanitation and meagre food rations. Contagious diseases such as measles, typhoid and dysentery were endemic. Many of the internees died. Emily Hobhouse visited the camps and brought the conditions to the attention of the British public. Public outcry resulted in the Fawcett Commission which corroborated Hobhouse's report and eventually led to improved conditions. The Boers surrendered and the Boer Republics were annexed by the British Empire. Jan Smuts—a leading Boer general—became a senior official of the new government and even became a top British official in the World War. In 1901, the six British self-governing colonies of Queensland, New South Wales, Victoria, Tasmania, South Australia, and Western Australia united to form the Commonwealth of Australia, with almost complete control of its internal affairs, but with foreign policy and defence handled by London. Edmund Barton was the first prime minister. The Liberal Party under Henry Campbell-Bannerman rallied Liberals around the traditional platform of free trade and land reform and led them to the greatest electoral victory in Liberal Party history. 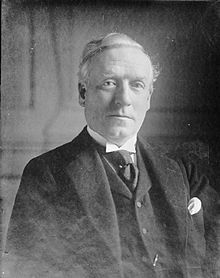 The Prime Minister was overshadowed by his frontbench, most notably H. H. Asquith at the Exchequer, Edward Grey at the Foreign Office, Richard Burdon Haldane at the War Office and David Lloyd George at the Board of Trade. Campbell-Bannerman retired in 1908 and was succeeded by Asquith. He stepped up the government's radicalism, especially in the "People's Budget" of 1909 that proposed to fund expanded social welfare programmes with new taxes on land and high incomes. It was blocked by the Conservative-dominated House of Lords, but eventually became law in April 1910. Almost half of the Liberal MPs elected in 1906 were supportive of the 'New Liberalism', which advocated government action to improve people's lives. 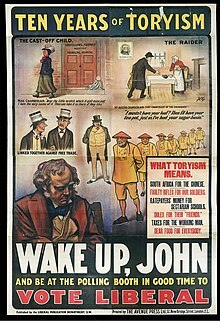 Liberals in 1906–1911 passed major legislation designed to reform politics and society, such as the regulation of working hours, National Insurance and the beginnings of the welfare state, as well as curtailing the power of the House of Lords. Women's suffrage was not on the Liberal agenda. There were numerous major reforms helping labour, typified by the Trade Boards Act 1909 that set minimum wages in certain trades with the history of "sweated" or "sweatshop" rates of especially low wages, because of surplus of available workers, the presence of women workers, or the lack of skills. At first it applied to four industries: chain-making, ready-made tailoring, paper-box making, and the machine-made lace and finishing trade. It was later expanded to coal mining and then to other industries with preponderance of unskilled manual labour by the Trade Boards Act 1918. Under the leadership of David Lloyd George Liberals extended minimum wages to farm workers. Germany's Chancellor Otto von Bismarck dominated European diplomacy from 1872-1890, with the determination to use the balance of power to keep the peace. There were no wars. 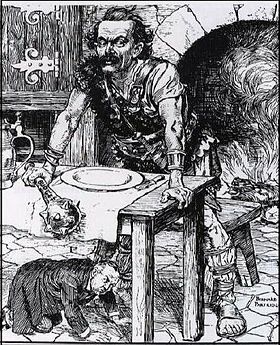 Bismarck was removed by an aggressive young Kaiser Wilhelm in 1890, effectively decentralizing the Bismarckian Order that had been shrewdly managed and empowering French efforts to isolate Germany. With the formation of the Triple Entente, Germany began to feel encircled: to the West lay France, with whom rivalry was awakening after a generation of dormancy following the Franco-Prussian War, to the East sat Russia, whose rapid industrialization worried leaders across the Continent, and in the seas, British primacy threatened a unified Germany's efforts to develop its ports and maintain its new global empire. Joseph Chamberlain, who played a major role in foreign policy in the late 1890s under the Salisbury government, repeatedly tried to open talks with Germany about some sort of an alliance. Germany was not interested. Meanwhile, Paris went to great pains to woo Russia and Great Britain. Key markers were the Franco-Russian Alliance of 1894, the 1904 Entente Cordiale linking France and Great Britain, and finally the Anglo-Russian Entente in 1907 which became the Triple Entente. France thus had a formal alliance with Russia, and an informal alignment with Britain, against Germany and Austria. By 1903 good relations had been established with the United States and Japan. The Triple Entente between Britain, France and Russia is often compared to the Triple Alliance between Germany, Austria–Hungary and Italy, but historians caution against the comparison. The Entente, in contrast to the Triple Alliance or the Franco-Russian Alliance, was not an alliance of mutual defence and Britain therefore felt free to make her own foreign policy decisions in 1914. The Liberals were highly moralistic, and by 1914 they have been increasingly convinced that German aggression violated international norms, and specifically that its invasion of neutral Belgium was completely unacceptable in terms of morality, Britain and Germany's obligations under the Treaty of London, and in terms of British policy against any one power controlling the continent of Europe. Until the last few weeks before it started in August 1914, almost no one saw a world war coming. The expectation among the generals was that because of industrial advances any future war would produce a quick victory for the side that was better-prepared, better armed, and faster to move. No one saw that the innovations of recent decades—high explosives, long-range artillery and machine guns—were defensive weapons that practically guaranteed defeat of massed infantry attacks with very high casualties. After 1805 the dominance of Britain's Royal Navy was unchallenged; in the 1890s Germany decided to match it. Grand Admiral Alfred von Tirpitz (1849 – 1930) dominated German naval policy from 1897 until 1916. Before the Germany Empire formed in 1871, Prussia never had a real navy, nor did the other German states. Tirpitz turned the modest little fleet into a world-class force that could threaten the British Royal Navy. 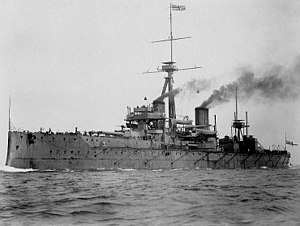 The British responded with new technology typified by the Dreadnought revolution. It made every battleship obsolete and, supplemented by the global network of coaling stations and telegraph cables, enabled Britain to stay well in the lead in naval affairs. Apart from a determination to retain a strong naval advantage, the British lacked a military strategy or plans for a major war. The Edwardian era stands out as a time of peace and prosperity. There were no severe depressions, and prosperity was widespread. Britain's growth rate, manufacturing output and GDP (but not GDP per capita) fell behind its rivals, the United States and Germany, but the nation still led the world in trade, finance and shipping, and had strong bases in manufacturing and mining. The industrial sector was slow to adjust to global changes, and there was a striking preference for leisure over entrepreneurship among the elite. However, major achievements should be underlined. London was the financial centre of the world—far more efficient and wide-ranging than New York, Paris or Berlin. Britain had built up a vast reserve of overseas credits in its formal Empire, as well as in its informal empire in Latin America and other nations. It had huge financial holdings in the United States, especially in railways. These assets proved vital in paying for supplies in the first years of the World War. The amenities, especially in urban life, were accumulating—prosperity was highly visible. The working classes were beginning to protest politically for a greater voice in government, but the level of industrial unrest on economic issues was not high until about 1908. Mortality declined steadily in urban England and Wales 1870–1917. Robert Millward and Frances N. Bell looked statistically at those factors in the physical environment (especially population density and overcrowding) that raised death rates directly, as well as indirect factors such as price and income movements that affected expenditures on sewers, water supplies, food, and medical staff. The statistical data show that increases in the incomes of households and increases in town tax revenues helped cause the decline of mortality. The new money permitted higher spending on food, and also on a wide range of health-enhancing goods and services such as medical care. The major improvement in the physical environment was the quality of the housing stock, which rose faster than the population; its quality was increasingly regulated by central and local government. Infant mortality fell faster in England and Wales than in Scotland. Clive Lee argues that one factor was the continued overcrowding in Scotland's housing. During the First World War, infant mortality fell sharply across the country. J.M. Winter attributes this to the full employment and higher wages paid to war workers. For housewives, sewing machines enabled the production of ready made clothing and made it easier for women to sew their own clothes; more generally, argues Barbara Burman, "home dressmaking was sustained as an important aid for women negotiating wider social shifts and tensions in their lives." Increased literacy in the middle-class gave women wider access to information and ideas. Numerous new magazines appealed to her tastes and help define femininity. The inventions of the typewriter, telephone, and new filing systems offered middle-class women increased employment opportunities. So too did the rapid expansion of the school system, and the emergence of the new profession of nursing. Education and status led to demands for female roles in the rapidly expanding world of sports. Women were very active in church affairs, including attendance at services, Sunday school teaching, fund raising, pastoral care, social work and support for international missionary activities. They quietly submitted to their almost complete exclusion from practically all leadership roles. As middle-class women rose in status they increasingly supported demands for a political voice. There was significant support for woman suffrage in all the parties, but the Liberal Party was in control after 1906 and a handful of its leaders, especially H. H. Asquith, blocked it. There were numerous organisations which did their work quietly. After 1897 they were increasingly linked together by the National Union of Women's Suffrage Societies (NUWSS) led by Millicent Fawcett. However front page publicity was seized by the Women's Social and Political Union (WSPU). Founded in 1903, it was tightly controlled by the three Pankhursts, Emmeline Pankhurst (1858–1928), and her daughters Christabel Pankhurst (1880–1958) and Sylvia Pankhurst (1882–1960). It specialized in highly visible publicity campaigns such as large parades. This had the effect of energizing all dimensions of the suffrage movement. While there was a majority of support for suffrage in parliament, the ruling Liberal Party refused to allow a vote on the issue; the result of which was an escalation in the suffragette campaign. The WSPU, in dramatic contrast to its allies, embarked on a campaign of violence to publicize the issue, even to the detriment of its own aims. Not all of society was accepting of contraceptives or abortion, and the opposition viewed both as part of one and the same sin. Abortion was much more common among the middle-classes than among those living in rural areas, where the procedure was not readily available. Women were often tricked into purchasing ineffective pills. In addition to fearing legal reprimands, many physicians did not condone abortion because they viewed it as an immoral procedure potentially endangering a woman's life. Because abortion was illegal and physicians refused to perform the procedure, local women acted as abortionists, often using crochet hooks or similar instruments. At the time, single mothers were the poorest sector in society, disadvantaged for at least four reasons. First, women lived longer, often leaving them widowed with children. Second, women had fewer opportunities to work, and when they did find it, their wages were lower than male workers' wages. Thirdly, women were often less likely to marry or remarry after being widowed, leaving them as the main providers for the remaining family members. Finally, poor women had deficient diets, because their husbands and children received disproportionately large shares of food. Many women were malnourished and had limited access to health care. Edwardian Britain had large numbers of male and female domestic servants, in both urban and rural areas. Middle and upper-class women relied on servants to run their homes smoothly. Servants were provided with food, clothing, housing, and a small wage, and lived in a self-enclosed social system inside the mansion. The number of domestic servants fell in the Edwardian era due to a declining number of young people willing to be employed in this area. The upper-classes embraced leisure sports, which resulted in rapid developments in fashion, as more mobile and flexible clothing styles were needed. During the Edwardian era, women wore a very tight corset, or bodice, and dressed in long skirts. The Edwardian era was the last time women wore corsets in everyday life. 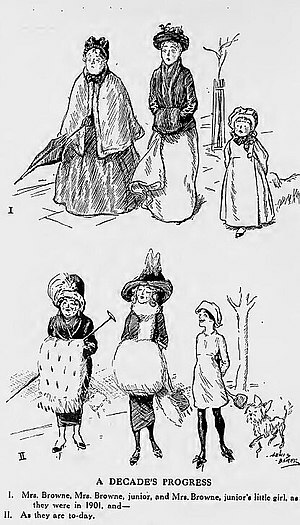 According to Arthur Marwick, the most striking change of all the developments that occurred during the Great War was the modification in women's dress, "for, however far politicians were to put the clocks back in other steeples in the years after the war, no one ever put the lost inches back on the hems of women's skirts". The 'Tea Gown' was one of the Fashion creations during the Edwardian era and when women starting to stop wearing corsets. More Afternoon and Tea parties were being held and for longer amongst the upper classes, thus the trend of the 'Tea Gown' was created. The Tea Gown was worn to receive guests. The fabric choices are usually sweet pea shades in chiffon, mousse line de sore, tulle with feather boas and lace. Lace was a ‘must-have’ in the Edwardian wardrobe. It represents femininity and wealth. ‘High and boned collars for the day; plugging off shoulder décolleté for the evening’. The Tea Gown's cuttings are relatively loose comparing to the evening gown's. The flow is quite feminine, usually decorated with lace. In which, Irish crochet was the more affordable alternative. Women often wore the tea gown un-corseted in order to create an atmosphere of daring intrigue in the afternoon. Long kid gloves, a flat pancake hat and held laced parasols on hand were always the choice of women's Fashion accessories. Parasols are different than umbrellas. The parasols that were widely use during the Edwardian era are not waterproof, they are made of fabric. It was not designed for functionality, but as a Fashion ornament. Over time, decorative ornaments became heavier, i.e. the hats, sleeves and hem. By the end of the Edwardian era, the hat is bigger in size, with more decorations like feathers and one or more plumes on top. The Edwardians developed new styles in clothing design. While the Victorian Era is associated with large, ankle-length, heavy, dark velvet gowns and bustles for the classes that could afford them, the Edwardian era favored more tightly fitting skirts and dresses made of lightweight fabrics designed for a more active lifestyle. Around 1913 women's dresses acquired a lower and sometimes V-shaped neckline in opposition to the high collars a generation before. This was considered a scandal and caused an outrage among the clergy throughout Europe. More than anyone [he] ... shaped the modern press. 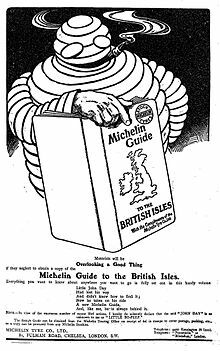 Developments he introduced or harnessed remain central: broad contents, exploitation of advertising revenue to subsidize prices, aggressive marketing, subordinate regional markets, independence from party control. The Edwardian era corresponds to the French Belle Époque. Despite its brief pre-eminence, the period is characterised by its own unique architectural style, fashion, and lifestyle. Art Nouveau had a particularly strong influence. Artists were influenced by the development of the automobile and electricity, and a greater awareness of human rights. 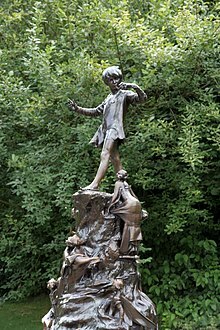 George Frampton's statue of Peter Pan, "erected in Hyde Park in 1912 ... immediately became a source of contention, sparking debate about the role of public statuary and its role in spaces of recreation." In fiction, some of the best-known names are J. M. Barrie, Arnold Bennett, G. K. Chesterton, Joseph Conrad, E. M. Forster, John Galsworthy, Kenneth Grahame, M. R. James, Rudyard Kipling, James Joyce, A.A. Milne, D. H. Lawrence, Edith Nesbit, Beatrix Potter, Saki, George Bernard Shaw, H. G. Wells, and P. G. Wodehouse. Apart from these famous writers, this was a period when a great number of novels and short stories were being published, and a significant distinction between "highbrow" literature and popular fiction emerged. Among the most famous works of literary criticism was A. C. Bradley's Shakespearean Tragedy (1904). Live performances, both amateur and professional, were popular. Henry Wood, Edward Elgar, Gustav Holst, Arnold Bax, George Butterworth, Ralph Vaughan Williams, and Thomas Beecham were all active. Military and brass bands often played outside in parks during the summer. The new technology of wax cylinders played on phonographs, made live performances permanently available for repetition at any time. Filmmakers Mitchell and Kenyon documented many scenes from Britain and Ireland from 1900–1907, sports, parades, factory exits, parks, city streets, boating and the like. Their films have survived in very good quality restored from the original negatives. The 1908 Summer Olympic Games were held in London. Popularity of sports tended to conform to class divisions, with tennis and yachting popular among the very wealthy and football favoured by the working class. Aston Villa maintained their position as the pre-eminent football team of the era, winning the FA Cup for the fourth time in 1904–05 and their sixth League title in 1909–10. The club colours of claret and sky blue were adopted by Burnley as a tribute to their success in 1910. Sunderland achieved their fourth league title in 1901–02. The era also saw Liverpool (1900–01, 1905–06), Newcastle United (1904–05, 1906–07, 1908–09) and Manchester United (1907–08) winning their first league titles. ^ a b Roy Hattersley, The Edwardians (2004). ^ J. B. Priestley The Edwardians (1970), pp. 55–56, 288–290. ^ Battiscombe, Georgina (1969). Queen Alexandra. London: Constable. p. 217. ISBN 978-0-09-456560-9. ^ James, Lawrence (1994). The Rise and Fall of the British Empire. Little, Brown and Company. ISBN 978-0-349-10667-0. ^ David Brooks, The age of upheaval: Edwardian politics, 1899–1914 (Manchester University Press, 1995). ^ Jon Lawrence, "Class and gender in the making of urban Toryism, 1880–1914." English Historical Review 108.428 (1993): 629–652. ^ Matthew Roberts, "Popular Conservatism in Britain, 1832–1914." Parliamentary History 26.3 (2007): 387–410. ^ Marc Brodie, "Voting in the Victorian and Edwardian East End of London." Parliamentary History 23.2 (2004): 225–248. ^ Kathryn Rix, "'Go Out into the Highways and the Hedges': The Diary of Michael Sykes, Conservative Political Lecturer, 1895 and 1907–8." Parliamentary History 20#2 (2001): 209–231. ^ David Dutton, "Unionist Politics and the aftermath of the General Election of 1906: A Reassessment." Historical Journal 22#4 (1979): 861–876. ^ Andrew S. Thompson, "Tariff reform: an imperial strategy, 1903–1913." Historical Journal 40#4 (1997): 1033–1054. ^ R. C. K. Ensor, England 1870–1914 (1936) pp 384–420. ^ G.R. Searle, A new England? : peace and war, 1886–1918 (2004), pp 185–87. ^ Michael Childs, "Labour Grows Up: The Electoral System, Political Generations, and British Politics 1890–1929." Twentieth Century British History 6#2 (1995): 123–144. ^ G.R. Searle, A new England? : peace and war, 1886–1918 (Oxford UP, 20040 pp 275–307. ^ Chris Wrigley (2002). Winston Churchill: A Biographical Companion. p. 311. ISBN 9780874369908. ^ Helen Irving, To Constitute a Nation: A Cultural History of Australia's Constitution (1999). ^ Rosemary Rees (2003). Britain, 1890–1939. p. 42. ISBN 9780435327576. ^ Ian Packer, Liberal government and politics, 1905–15 (Palgrave Macmillan, 2006). ^ Sheila Blackburn, "Ideology and social policy: the origins of the Trade Boards Act." The Historical Journal 34#1 (1991): 43–64. ^ Samuel R. Williamson Jr., "German Perceptions of the Triple Entente after 1911: Their Mounting Apprehensions Reconsidered" Foreign Policy Analysis 7#2 (2011): 205-214. ^ H.W. Koch, "The Anglo‐German Alliance Negotiations: Missed Opportunity or Myth?." History 54#182 (1969): 378-392. ^ G.P. Gooch, Before the war: studies in diplomacy (1936), pp 87-186. ^ Strachan, Hew (2005). The First World War. ISBN 9781101153413. ^ Gerd Krumeich, "The War Imagined: 1890–1914." in John Horne, ed. A Companion to World War I (2012) pp 1-18. ^ Matthew S. Seligmann, "Failing to Prepare for the Great War? The Absence of Grand Strategy in British War Planning before 1914" War in History (2017) 24#4 414-37. ^ Clive H. Lee, "Regional inequalities in infant mortality in Britain, 1861–1971: patterns and hypotheses." Population Studies 45.1 (1991): 55–65. ^ J. M. Winter, "Aspects of the impact of the First World War on infant mortality in Britain." Journal of European Economic History 11.3 (1982): 713. ^ Margaret Beetham, A magazine of her own? : domesticity and desire in the woman's magazine, 1800–1914 (Routledge, 2003). ^ Guerriero R. Wilson, "Women's work in offices and the preservation of men's 'breadwinning'jobs in early twentieth-century Glasgow." Women's History Review 10#3 (2001): 463–482. ^ Gregory Anderson, The white-blouse revolution: female office workers since 1870 (1988). ^ Carol Dyhouse, Girls growing up in late-Victorian and Edwardian England (Routledge, 2012). ^ Cartriona M. Parratt, "Athletic 'Womanhood': Exploring sources for female sport in Victorian and Edwardian England." Journal of Sport History 16#2 (1989): 140–157. ^ Roger Ottewill, "'Skilful and Industrious': Women and Congregationalism in Edwardian Hampshire 1901–1914." Family & Community History 19#1 (2016): 50-62. ^ Martin Pugh, Women's suffrage in Britain, 1867–1928 (1980). ^ June Purvis, "Gendering the Historiography of the Suffragette Movement in Edwardian Britain: some reflections." Women's History Review 22#4 (2013): 576-590. ^ Martin Roberts (2001). Britain, 1846-1964: The Challenge of Change. Oxford UP. p. 8. ISBN 9780199133734. ^ Jane Marcus, Suffrage and the Pankhursts (2013). ^ England, Historic. "The Struggle for Suffrage | Historic England". historicengland.org.uk. Retrieved 3 October 2017. ^ Melanie Phillips, The Ascent of Woman: A History of the Suffragette Movement and the Ideas behind it (Abacus, 2004). ^ a b c Knight, Patricia (1977). "Women and Abortion in Victorian and Edwardian England". History Workshop. 4: 57–68. doi:10.1093/hwj/4.1.57. PMID 11610301. ^ a b c McLaren, Angus (1977). "Abortion in England 1890–1914". Victorian Studies: 379–400. ^ a b Thane, Pat (1978). "Women and the Poor Law in Victorian and Edwardian England". History Workshop. 6 (6): 29–51. doi:10.1093/hwj/6.1.29. JSTOR 4288190. ^ Benson, John (2007). "One Man and His Woman: Domestic Service in Edwardian England". Labour History Review. 72 (3): 203–214. doi:10.1179/174581607X264793. ^ Davidoff, Lenore (1973). "Mastered for Life: Servant and Wife in Victorian and Edwardian England". Society for the Study of Labour History. 73 (27): 23–24. ^ Pooley, Sian (2008). "Domestic Servants and Their Urban Employers: A Case Study of Lancaster 1880–1914". The Economic History Review. 62 (2): 405–429. doi:10.1111/j.1468-0289.2008.00459.x. ^ Donald Read, Edwardian England 1901-15: society and politics (1972) pp 257-58. ^ Marilyn Constanzo, "'One Can't Shake Off the Women': Images of Sport and Gender in Punch, 1901–10." The International journal of the history of sport 19#1 (2002): 31–56. ^ Sarah Cosbey, Mary Lynn Damhorst, and Jane Farrell-Beck. "Diversity of daytime clothing styles as a reflection of women's social role ambivalence from 1873 through 1912." Clothing and Textiles Research Journal 21#3 (2003): 101–119. ^ Marwick, Arthur (1991). The Deluge. British Society and the First World War (Second ed.). Basingstoke: Macmillan. p. 151. ISBN 978-0-333-54846-2. ^ J., Stevenson, N. (2012) . Fashion : a visual history from regency & romance to retro & revolution : a complete illustrated chronology of fashion from the 1800s to the present day (1st U.S. ed.). New York: St. Martin's Griffin. ISBN 9780312624453. OCLC 740627215. ^ 1899-1975., Laver, James (2002). Costume and fashion : a concise history. De La Haye, Amy., Tucker, Andrew (Fashion journalist) (4th ed.). New York: Thames & Hudson. ISBN 978-0500203484. OCLC 50081013. ^ Olian, JoAnne (1998). Victorian and Edwardian Fashions from "La Mode Illustrée". New York: Dover Publications. ISBN 9780486297118. ^ Ann Beth Presley, "Fifty years of change: Societal attitudes and women's fashions, 1900–1950." Historian 60#2 (1998): 307–324. ^ Kristina Harris, Victorian & Edwardian Fashions for Women, 1840 to 1919 (Schiffer Publishing, 1995). ^ Sarah Edwards, "'Clad in Robes of Virgin White': The Sexual Politics of the 'Lingerie'Dress in Novel and Film Versions of The Go-Between." Adaptation 5#1 (2012): 18–34. ^ Alison Gernsheim (1963). Victorian & Edwardian Fashion: A Photographic Survey. Courier Corporation. p. 94. ISBN 978-0-486-24205-7. ^ R.C.K. Ensor, England, 1870-1914 (1936) pp 309-16. ^ Lord Beaverbrook, Politicians and the War, 1914–1916 (1928) 1:93. ^ J. Lee Thompson, "Fleet Street Colossus: The Rise and Fall of Northcliffe, 1896–1922." Parliamentary History 25.1 (2006): 115-138. ^ P. P. Catterall and Colin Seymour-Ure, "Northcliffe, Viscount." in John Ramsden, ed. The Oxford Companion to Twentieth-Century British Politics (2002) p. 475. ^ Priestley, J. B. (1970). The Edwardians. London: Heinemann. pp. 176–178. ISBN 978-0-434-60332-9. ^ J. B. Priestley The Edwardians (1970), pp. 132–139. ^ J. B. Priestley The Edwardians (1970), pp. 172–176. ^ A.S. Gray, Edwardian Architecture: A Biographical Dictionary (1985). ^ David Littlefield, "White City: The Art of Erasure and Forgetting the Olympic Games." Architectural Design 82#1 (2012): 70–77. ^ Vanessa Toulmin and Simon Popple, eds., The Lost World of Mitchell and Kenyon: Edwardian Britain on Film (2008). ^ see for example "The Lost World Of Mitchell And Kenyon – Episode 1 – 4/6"
^ James Anthony Mangan, ed. A sport-loving society: Victorian and Edwardian middle-class England at play (Routledge, 2004). ^ Tony Mason, "'Our Stephen and our Harold': Edwardian footballers as local heroes." The International Journal of the History of Sport 13#1 (1996): 71–85.